My father lived and worked in Borneo and often told us stories of the majestic and shy “men of the forest” that he had the good fortune to observe during his time there. Orang utan- the name derived for these wonderful red apes – from the Malay Orang Hutan – men of the forest. My father worked there in 1964, coincidentally the same year that the famous Sepilok Orang Utan Rehabilitation Centre (SORC) opened. The Sanctuary was opened in 4,500 hectares of virgin jungle (40 minutes/25 km north from Sandakan, Sabah, East Malaysia, on the island of Borneo) to help orphaned baby orang utans who lost their mothers due to logging, plantations and illegal hunting. The objective was to return them back to the wild as soon as they were trained to cope. Baby orang utans typically stay with their mothers until they are 7 or 8 years old. If separation occurs before this age, the baby orang utan is completely helpless, and thus is totally dependent on centres such as Sepilok for survival. Without the care, training and guidance that this centre offers orphans, the future for them is bleak and death the most likely outcome. SORC is now one of the most popular places in the world to see Asia’s great ape, the Orang utan (Pongo Pygmaeus) in its native habitat. It is rated as the second “must see” in Malaysia after Mt Kinabalu, also in Sabah. At the beginning of the 20th century orang utans in Borneo numbered over 315,000 – today their numbers are fast dwindling. In 2006 numbers had already fallen to 45,000 and I was shocked to learn during our visit to the famous Sepilok centre in December 2010 that numbers may have been cut further – read below for more details. Their cousin Sumatran orang utans (species: Pongo Abelii) – the slightly redder apes in Sumatra – face an even bleaker situation with numbers only amounting to around 4000. For them, extinction in the wild is most likely in the next 5 years. Meanwhile, in Malaysia deforestation rates between 1999 and 2005 rose some 86% according to conservation sources with 149,200 hectares lost annually since 2000. This is indeed a serious issue for conservation and preservation of this special species. As more and more of the Borneo landscape is being changed from its’ own rich vibrant diverse rainforest to acres and acres of palm oil plantations, the lost habitat is spelling out the long-term demise of these and other animals, plants and homes for the indigenous people who live there. It was after the birth of my twin sons in the early 2000’s that I found time to research and find out more about my beloved orang utans. Thanks to the internet, information, research papers and work being conducted by charities was easily accessible. I was horrified to learn that due to the reasons listed above, the numbers of orang utans in the wild was rapidly falling. Back in 2005 experts were estimating that if no action was taken to help the orang utans, they would be extinct in the wild by 2012. It was then that I decided I would, in a very small way, try to make a difference. Clearly it is the governments who need to set policy to assist by setting guidelines on land use, allocating and protecting virgin rainforest etc. It is also businesses that need to act more environmentally responsible and as well society at large to respond accordingly. Nevertheless, the work that many charities are doing to help protect and aid these endearing primates (who share 96.5% to human genes) are certainly helping to make a difference via the various rehabilitation, land purchase and release programmes. If we want our children and grandchildren to have the pleasure to still observe these delightful redheads in the wild, we need to take action today. I therefore set about to create awareness and education of the young via early learning stories aimed at under 7 years old and more informative stories packed with facts and stats aimed at 8 years old +. I also started to spread the word and I’m working to encourage as many schools as possible to include information with their rainforest education programs to ensure that today’s young people are informed on the plight of the orang utans. Better still, one hopes the young will feel empowered to work with governments, business and charities to safeguard the future, for those that will remain in the wild. Another issue facing Borneo and the orang utans future is palm oil. There is serious concern that not all palm oil production is sustainable, with issues relating to biodiversity, soil degradation, local people, land rights and many other matters. Development of new plantations has resulted in the conversion of large areas of forests with high conservation value and has threatened the rich biodiversity in these ecosystems. In particular orangutan habitats have been threatened by palm oil production. Scientists say the palm oil industry is the biggest threat to orangutans, with the species driven to extinction within 12 years unless the devastation of their natural habitat is halted. Some environmental campaigners claim that in 15 years, 98% of the rainforests in Indonesia and Malaysia will be gone unless drastic action is taken to find ways of producing sustainable palm oil. The expansion of oil palm plantations has also given rise to social conflicts between the local communities and project proponents in many instances. As a result, the Roundtable on Sustainable Palm Oil (RSPO) was established in 2003 to tackle these problems head on. 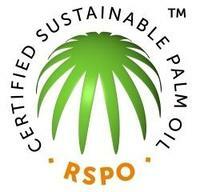 GreenPalm, which has been exclusively endorsed by the RSPO, is already making a significant contribution. GreenPalm is a certificate trading programme which is designed to tackle the environmental and social problems created by the production of palm oil. By buying a product which bears the GreenPalm logo, consumers can make a positive contribution to the production of certified sustainable palm oil (CSPO) and palm kernel oil (CSPKO). On that note, to celebrate my half century, I felt compelled to visit Borneo, in the hope to see first hand the beautiful orang utans in the wild (before it was too late) and to visit Sepilok to learn more about their important work. As my sons had adopted two of the Sepilok babies: Michelle and Ceria we had an added incentive to visit. Ahead of visiting we Sepilok we decide to take a day to cruise along the Sungai Kinabatangan river – the longest river in Sabah. We were rewarded by being able to see crocodiles, various snakes, many proboscis monkeys, long tailed and pig tailed macaques, wild pigs, and a wide range of birds including hornbill, storks, snake birds and eagles. 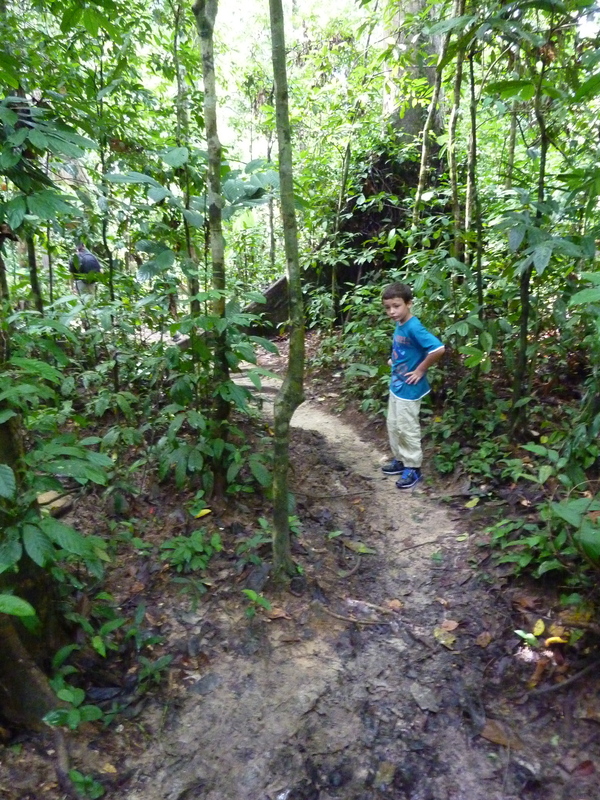 We marvelled at the colourful butterflies that fluttered around but sadly no orang utans were spotted in the tree tops. Certainly elusive and difficult to observe in the wild, but becoming a rare treat as they systemically lose their habitat each year. 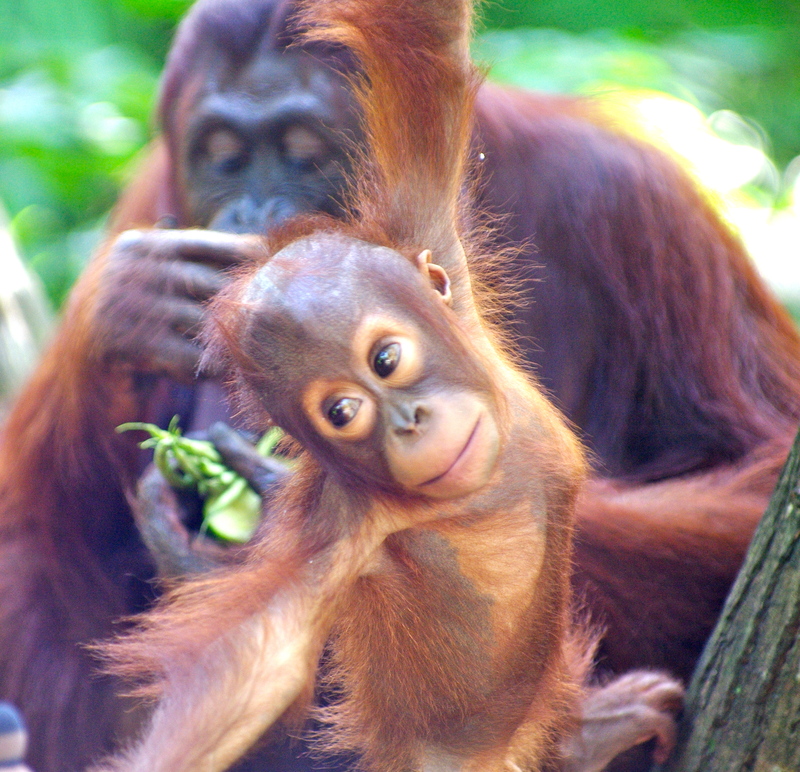 A friend had visited in December 2009 and lucked out by spotting one orangutan during her cruise. The next day we negotiated with a local taxi to take us to both Sepilok and the nearby Labuk Bay Proboscis monkey sanctuary. We headed north out of Sandakan toward the centre, nestled in 40 sq km of the Kabili-Sepilok rainforest reserve. 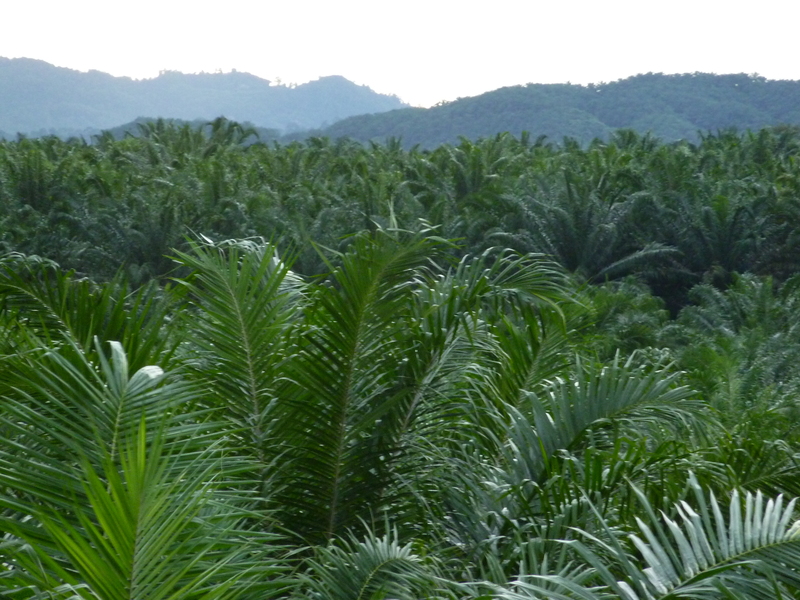 My heart sank seeing the miles and miles of palm oil plantations travelling towards the centre and sanctuary. Thank heavens that Sabah set up this protected reserve back in the 1960’s. As we arrived at the centre I was surprised how immaculate the grounds were – with beautiful gardens edging the modern, well-kept buildings – it felt as if you were arriving at a hotel rather than a nature reserve. Nevertheless, we hurriedly said farewell to our taxi driver and ran, yes ran, to the centre to find the ticket office. Arriving at 9 am just as the centre opened, we hoped to have the ability to approach the feeding platform early, in the hope to experience an early sighting ahead of the crowds. Sadly we were not the only people with the same idea! I had been in contact with the UK orang-utan appeal and had learnt that one of their representatives would be at the centre. We enquired at the reception desk if Liz Winterton, from the Appeal was available, and were surprised to hear her voice shout yes from the other side of the ticketing area! With tickets in hand we went over to meet Liz who was already on duty with her information stand – promoting adoptions of available babies at Sepilok (together with photos and information), and an information board summarizing some of the projects the Appeal have done with Sepilok during the past year (Vet staffing, transportation, cages for the sick or newly arrived orphans etc). Liz promised to join us later at the feeding platform to help us identify any visitors! We were instructed to place all our bags and belongings in the nearby lockers. Some things are strictly not allowed – ie drinks, and insect spray as these pose very real dangers to the wild animals (an orang-utan has chocked to death after getting a water bottle cap stuck in its throat). We were informed that an inquisitive primate could steal even hats, glasses, and bags. With cameras firmly secured to our bodies we strode towards the rainforest walkway. We head out into the humid jungle boardwalk and embrace the beautiful sight of ancient trees. The forest is clearly hundreds of years old – the canopy of the tall trees provides much needed shelter from the sun. Much taller than the trees that lined the riverbanks yesterday. Ferns grow in the dappled shade, clinging on to sides of damp tree limbs. Thick moss thrives on the north faces of fruit trees and the smell of the muddy water from the forest floor is evident. We are surprised to also identify the smell of primates not far away in the trees – a wet musky pungent odour. We wonder how we must smell to them. 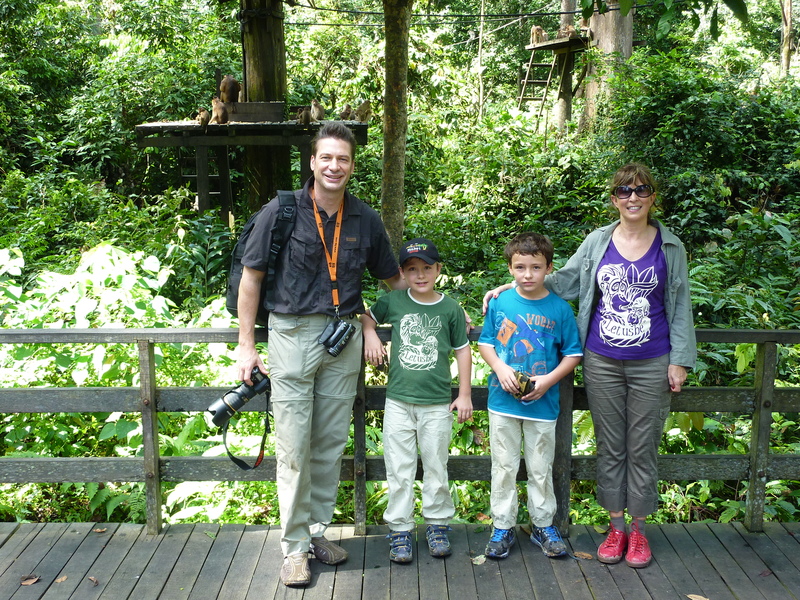 We were grateful to easily make our way through the hot, sticky rainforest on the elevated wooden boardwalk. There had been a huge thunderstorm the night before and we could see how waterlogged and muddy the ground below was. We are instantly enrobed with the sounds and calls of the forest. My children claim to immediately hear the kissing cry of the orang utans (experts at 7 years old thanks to many hours watching the BBC’s Orang-utans Diaries). Bird whistles, screaming gibbons and tree branch and leaf rustles create an element of interest and potential danger. The humidity is intense – sweat drips down your face and the sensation is that of being in a sauna. Clothed in a long sleeve shirt – to avoid the risk of leeches attaching to you, which was a real threat – increased my temperature and discomfort. The ease and speed at which you can march 250 m to the feeding platform in “wild” rainforest eliminates the real danger of experiencing trekking in knee high mud and watching out for snakes. 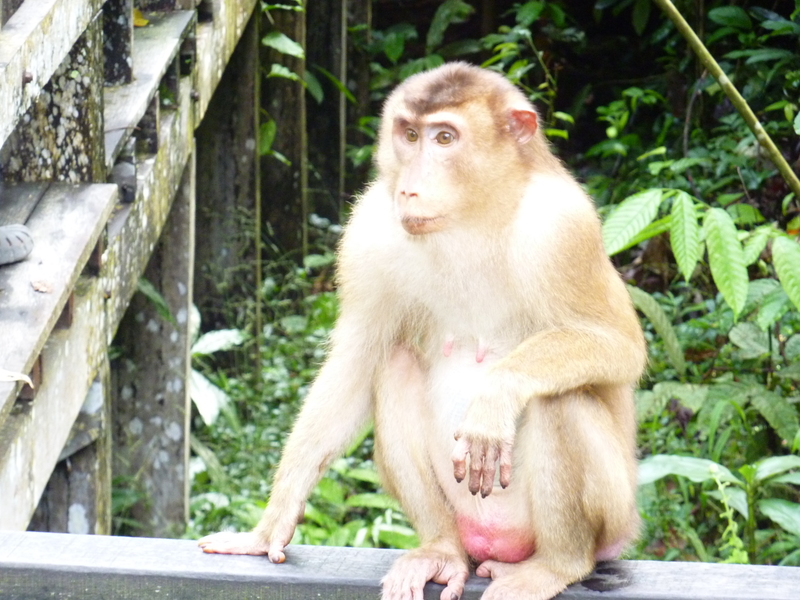 Nevertheless, the laissez faire approach quickly evaporates when we come face to face with hungry Macaques on our path. A park ranger quickly appears and warns people not to stare or have eye contact, not to touch it or attempt to feed it. I rush to pull my son away as he stares at the inquisitive primate. Meanwhile, people walking ahead of us, come head to head with an aggressive male macaques. There is banging and vocal exchanges as they quickly run for safety. The rangers warnings were no joke. We quickly back away and find a safe spot on the feeding platform – reminding the children this is not a zoo but the wild! We are about 25 minutes ahead of the official feeding time. Nevertheless we decide to remain and safeguard our good location. We observe blue-black and other colour butterflies flying and settling around. A group of very noisy long tailed Macaques and other monkeys arrive and check out the platform for any left over scraps. One would think they have their own watches to alert them to the feeding time that was due. As the feeding hour approaches, more and more people arrive and finally the platform is crowded with hot, sweaty tourists all waiting in anticipation – cameras/camera phones and video a ready. What a mysterious sight for the wild animals to observe. “Who is really watching who?”crossed my mind as we waited in anticipation of a great ape. 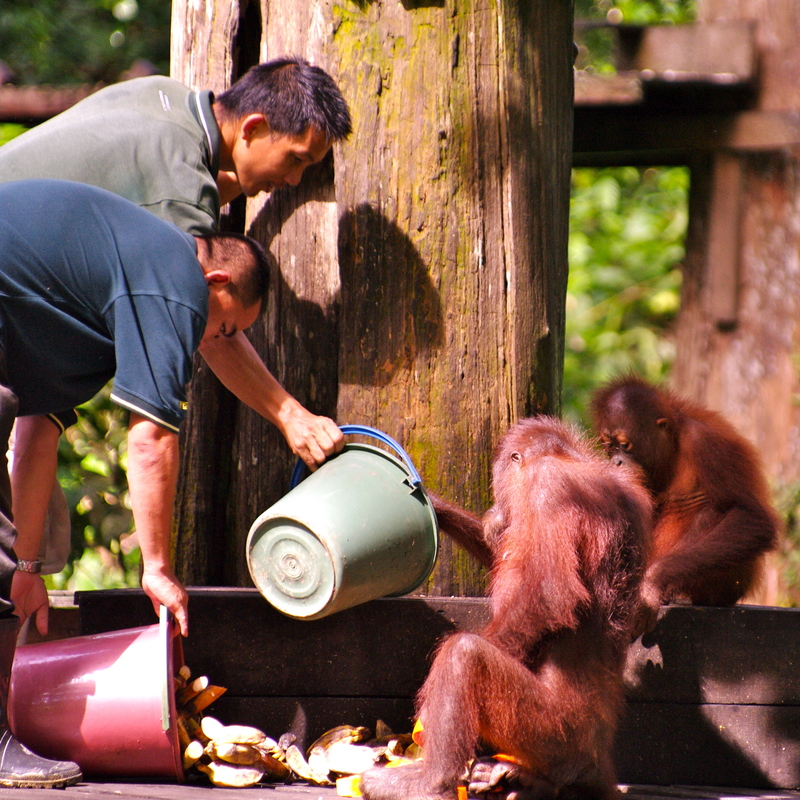 At 10 am the rangers arrives with buckets of food and a troupe of hungry monkeys arrive on the scene. The rangers push and persuade this cheeky group to leave – after all the food was for the orang utans – they could have any remaining leftovers. 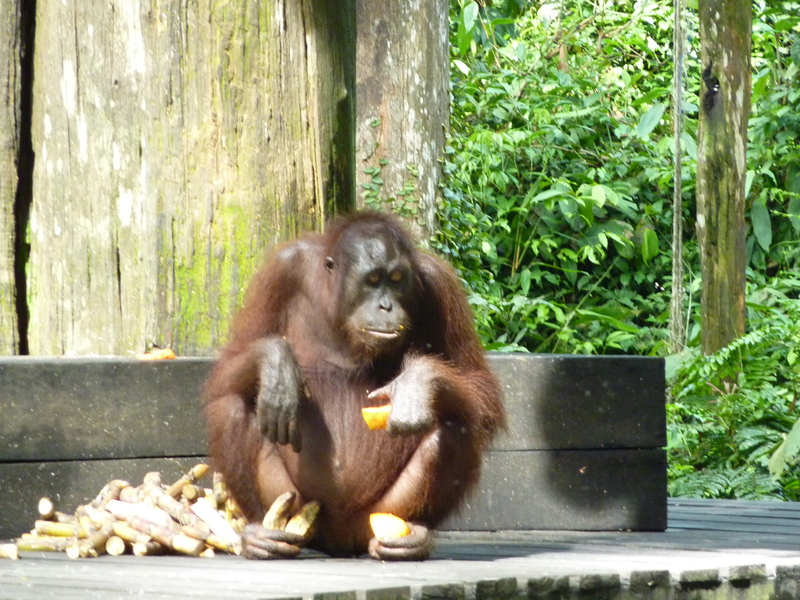 There is always a second feeding at 3 pm for those orang utan who miss the morning session. Clearly the monkeys know the routine and swing away to wait their turn. Suddenly as if on queue we hear loud rustling of leaves in the trees. We hold our breath – yes a blur of red hair can be seen in the distance. Our long wait is rewarded. We are lucky today – despite the early rain and plentiful fruit in the forest, a mother orang-utan and her youngster can be seen swinging to towards the feeding platform. The orang utans use the vine rope that has been secured between trees and the feeding platform to arrive. They move effortlessly, swinging hand-to-hand, like circus acrobats. The cameras click as stellar photo opportunities are presented. I note that everyone is smiling, staring, pointing at the proficient trapeze-artist movements. The pair arrive on the platform and inspect today’s offerings. We have been informed that the choice of food is always the same to ensure it is boring to the orang utans – today’s delivery appeared to be bananas and sugar cane tubes. The idea is that by having a limited choice they will be encouraged to forage in the forest for different fruits to supplement their diet. Orang utans are known to eat up to 500 different types of fruit, leaves, and insects. Clearly nursing mothers, who may be having difficulty finding sufficient food, can use this service to supplement their efforts. These shy and bashful but highly intelligent creatures are clearly uncomfortable at the spectacle they find themselves in. You can sense the mother is aware of the crowds but does not want to be watched. She places food in every hand and foot – looking like a greedy child- and she turns her back on the crowd. Liz from the UK Orangutan Appeal joins us at this moment and explains that the mother is Mimi, a 17 year old adult orang utan, together with her 6 year old son, Rony born at Sepilok in 2004. Mimi is a regular guest at the feeding platform, especially when Rony was younger. She had a very large appetite whilst she was suckling her young baby, but continues to use the feeding platform service to supplement her own foraging efforts. She explains that whilst there are over 150 orang utans who have been released at Sepilok, only 6-10 orang utans currently visit the platform at feeding time. Currently 3 sets of mothers and babies have been regular visitors. Due to the rainstorm that had occurred in the early hours, orang utans are like humans, and don’t like to get wet. If they have found a nice dry spot, they will typically not venture far from their shelter. Orang utans have been seen using large leaves as umbrellas or making rain hats out of leaves – the most ingenious of primates! As a result for this morning’s feeding only Mimi and Rony have left their cover for breakfast. She speculates that the others may visit this afternoon, once the ground was a little dryer. Mimi swings away, with additional food in her feet, and Rony enters the platform to select his breakfast before the hungry waiting monkeys jump back on the platform to clean up the left-overs. The waiting crowd keenly watches Rony’s eating antics. He lingers for a short while and then chases to catch up with his mother. The assembled group wait in the hope for more visitors, but a few gibbons that have now joined the feast, and no more orang utans arrive. Slowly the crowd disperses and we continue along the boardwalk. As we had registered to take the walking trail, we step off the wooden path and head towards the muddy hiking path. There are a number of trails ranging from 250m to 4km. Guided night walks can also be arranged if you are that adventurous. We’ve been told to look out for green snakes, the blood sucking leeches as well as flying squirrels and dozens of different bird species. Thankfully for me we don’t encounter any snakes only a very large and swollen caterpillar, pretty hornbill birds and others I could not identify as well as gibbons and those cheeky macaques. The sounds of the jungle continued to embrace us and I have to admit for the first time I was beginning to feel a little frightened. After the “safe” feeling around with feeding platform, with various rangers on guard, we were quite alone in a rainforest! The sticky mud was now becoming an effort to navigate and the ever-present risk of standing on a snake was troubling me. As a result, we decided to turn back and head to the centre to attend the Nature Education Video show. We were pleasantly surprised to note that Liz from the Appeal was leading the briefing. After the informative video on the objectives of Sepilok she gave an overview on the work of the UK Orangutan Appeal. She alerted the visitors to the important programs that her charity help with at Sepilok and highlighted ways how people can help : Adopting a baby orang-utan, buying an Appeal Calendar, T-shirt, making a donation or for those buddy photographers at Sepilok – offering licence/copyright of their photos to the charity to use in publicity. The biggest shock I received was hearing her update on latest statistics. She advised that only 25,000 orang-utans were now left in the wild – I was unclear if she was only talking about Malaysia or if this also included Indonesia/Borneo. If that was a correct world status it means that another large percentage of orang-utans have been lost since 2005 when numbers were stated as being 45,000. Our taxi driver, a local guide, told us how hard it was to really know the true number of oran utans. He had worked with a group of researchers and the way they worked to identify orang utans numbers in a given area was by counting “tree nests”. Orang utans can make up to 3 nests a day, so it was a very hit and miss way but the only method to “count” them. As orang utans are so shy and live high up in the rainforest canopy, it is almost impossible to see them and arrange an accurate evaluation on numbers – especially as they live separately over vast kilometres of impassable rainforest. People were interested, as was I, as to whether you could visit the special nursery area at Sepilok where the babies such as Michelle and Ceria were receiving training before their release. Sadly this was not possible due to the risk infection being transmitted between humans and the orang-utans. Whilst this was totally understandable, it was quite something to explain to my 7 year olds that after travelling half way around the world they could not see their “adopted orang-utans”. When the orang utans first arrive at the rehabilitation centre, they are quarantined and often need treatment for malnutrition and trauma. Injuries can include missing limbs, machete and chainsaw cuts, burns from being doused in petrol and set alight, and sometimes bite wounds from other animals. They are also tested for diseases. 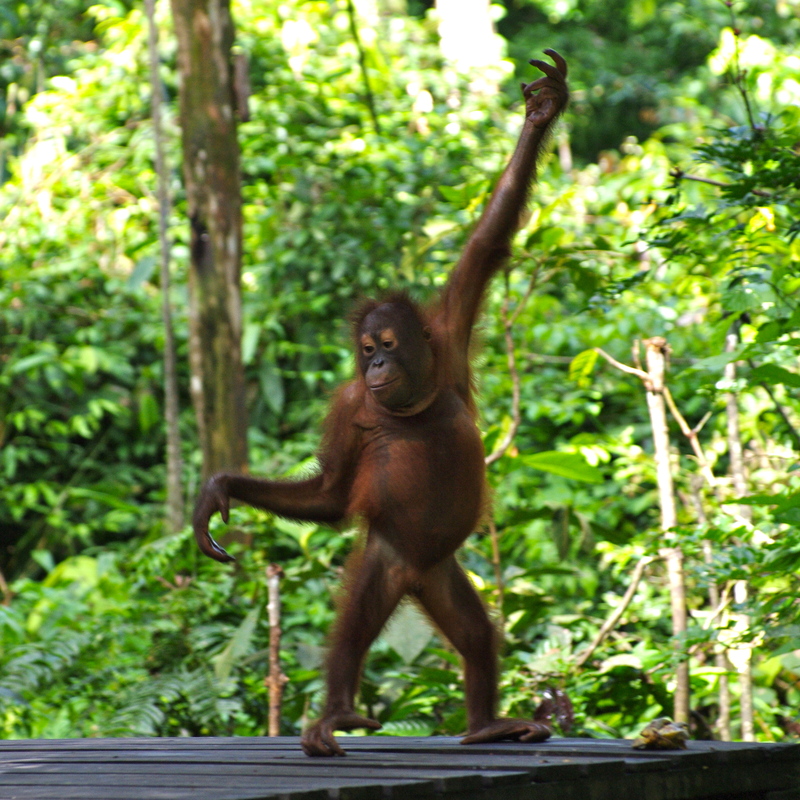 Each orang utan is provided with the necessary education and skills it will require in the forest if it is to survive. It struck me afterwards that perhaps installing a webcam on the nursery space could be a solution. Anyone interested to observe the youngest at play could pay a small fee (example 1 dollar) to gain access to the viewing webcam via a password. Or an alternative could be for the park to periodically film the work they are doing and place footage online. I do hope they will consider! Before our departure for the Proboscis Monkey Sanctuary (covered in a separate report) we head over to the attractive café nestled between the trees and parking area. We enjoy a local noodle dish and meet some Australian teachers who were visiting Sepilok and adopting 3 orang utans for their classes! Good job and great news that informed youngsters are working to help! • An exciting, never-to-be-forgotten adventure into South East Asia and Malaysian culture. 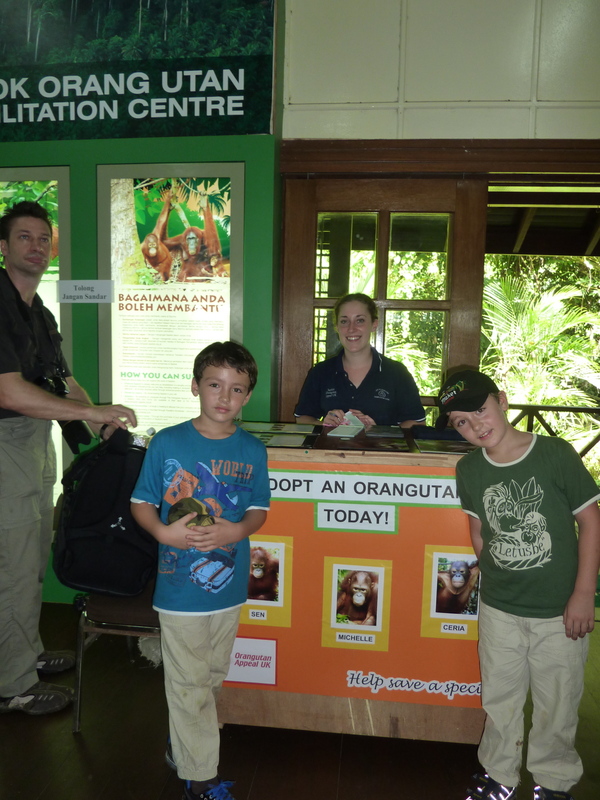 • The enormous satisfaction of helping Orang-utans knowing that you made a difference to them. • New skills, more confidence, a greater understanding of a different culture, invaluable personal and professional development. • And best of all … an unforgettable experience! The visit to Sepilok was certainly an amazing experience. Thank you Sepilok for safeguarding this rainforest paradise and allowing us to have a glimpse into the private world of its inhabitants. Having the opportunity to be in a relatively “safe” environment that is actually “the wild” is unique. We have all grown up watching nature shows on the TV and at one time or another, perhaps dreamed of being one of those TV explorers. 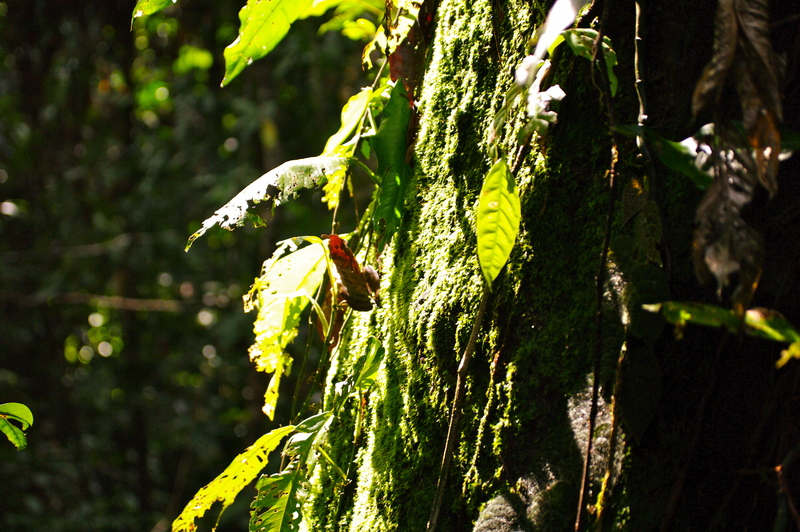 Sepilok gave one the chance to observe, smell and feel the atmosphere of a rainforest. Better still, we had the good fortune and blessing to see wild animals at work and play. Seeking out food, playing with their young and moving between the trees – something that typically would be impossible to experience in a hidden part the jungle, unless you were very lucky. Orang utans are gentle, intelligent primates that speak to you through their very expressive eyes. It was easy to understand how uncomfortable the mother orang-utan felt on the feeding platform. Perhaps fearing for her young and wondering why were we there in her forest… Indeed, humans have not played straight with the forest inhabitants. They need another chance to live in peace, in their wonderful rainforest home. Everyone can play their part. We can start by supporting the use of sustainable palm oil. By encouraging your friends and indeed yourself to demand sustainable palm oil in your purchases (via lobbying manufacturers etc) we can all contribute to eliminating the loss of our precious rainforests. This will make a positive step to helping the plight of the orang utans. Let’s hope that the further use of virgin rainforest will slow down and that sufficient land will remain for the orang utans and other animals so that orang utans can continue to thrive – simply just let them be. Identifying suitable release sites for the orang utans is increasingly difficult with the current rate of native habitat destruction. It is a common threat that is also faced by the people living a traditional hunter-gatherer lifestyle – whose homes are being lost and displaced by palm oil plantations. Sadly I fear the final outcome for this unique primate is living in much reduced numbers in the various forest reserves that will finally and hopefully be allocated to them. For the moment, I urge everyone to support the people who are helping to make a difference via the various charity work that is taking place in Borneo and Sumatra. 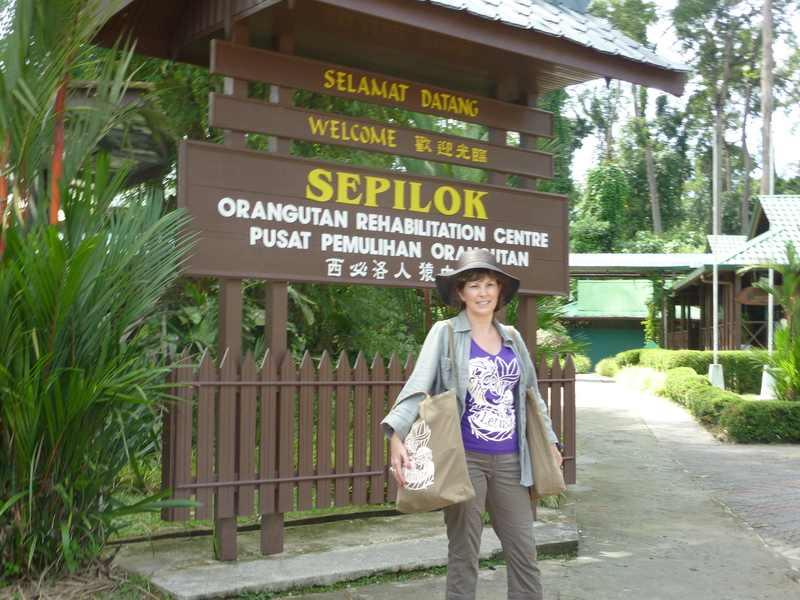 Sepilok – offering the orang utans orphans another chance to live in the wild. Sandra (Chidgey) Arthur and family, Richard, Alexandre & Edouard. Brief visitors to Sepilok December 2010. * Copyright 2011 Photography: Sandra Arthur : Richard Arthur. All rights reserved. Inspired to do some ecotourism or better still join a volunteer work effort in Borneo? Find out details on some of the programs available in 2011. Sandra S C Arthur writes children’s books, some of which are based on environmental themes. Here latest titles all support Orangutan charities. Junior teen novel – with environmental facts and stats. Book sales support orangutan charities. Available in hard/soft back book AND as an ebook with audio/music. An ideal adventure book for children under 9 years. 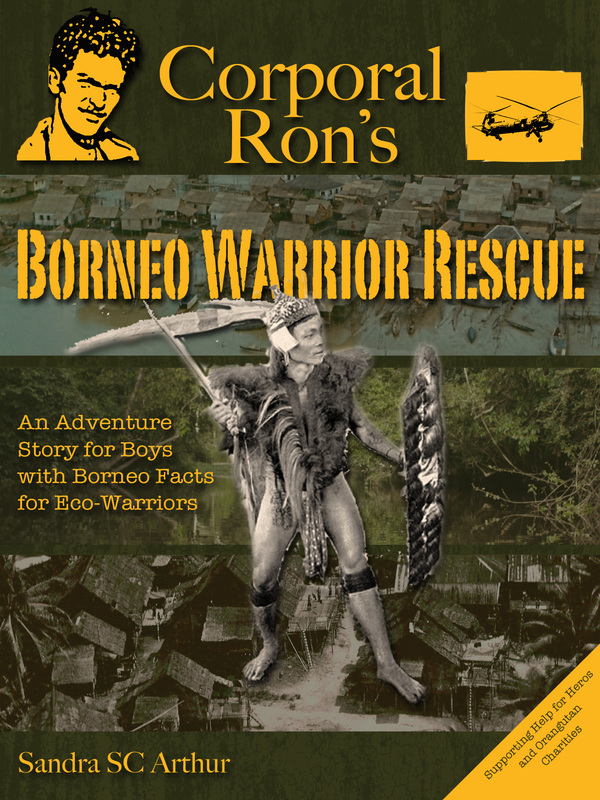 It follows the curious story of “Radio Ron”, as he takes a journey down a rainforest river, with Borneo Dayak tribes-people. This a hilariously amusing picture book that will appeal to children, young and old. At the same time, learn interesting facts about the unique and endangered animals of Borneo (orangutans) and review parent and educator notes, at the back, for a lively reading and educational experience with your children. This book also includes games, puzzles and suggested classroom activities. “It looks and sounds truly amazing”. Isobel, France. “Great book, great story, wonderful illustrations.” Glen, Peñíscola, Spain. 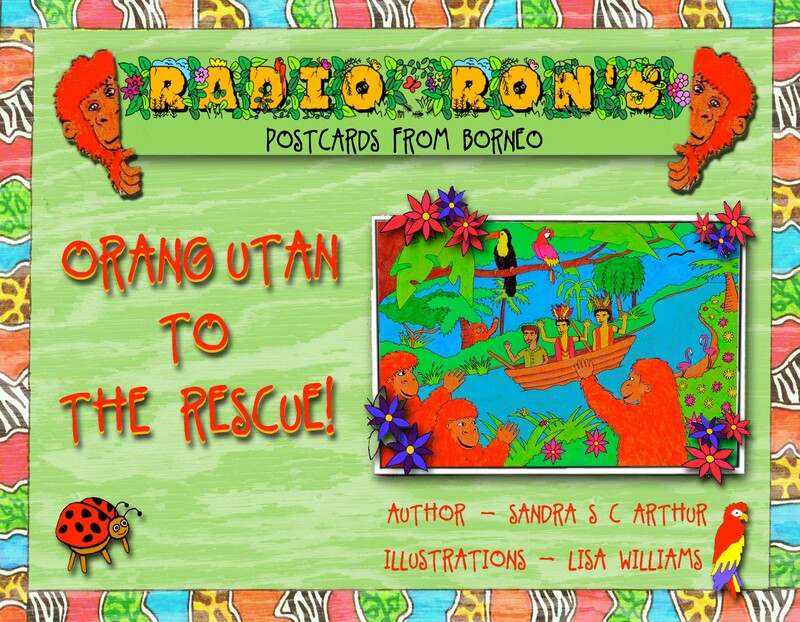 “I found Radio Ron’s Postcards from Borneo a useful book/ebook to stimulate and help me inject fun into my English classes.” Stephanie (Teacher) France. “Radio Ron – another best seller!” John, France. “Crocodile Attack! Looks and sounds amazing. The audio eBook really brings the story to life :)” Jane, UK “My students love reading this book and especially enjoy “hunting for Omar the Orangutan!” The eBook was great for homework to allow the kids to hear and listen to the story once again.” Elaine (Teacher) UK.